After the vernal equinox, when the days become longer than the nights, flowers herald the start of the warm weather. 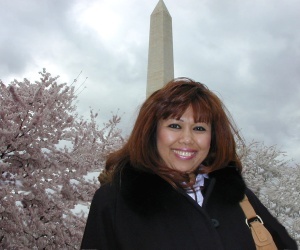 Blooming cherry trees offer colorful panoramas that bring thousands of tourists to the capital of the United States. The Cherry Blossom Festival is a celebration of spring held during the last week of March and the first week of April when the cherry trees are usually in full bloom. In Japan, the flowering cherry tree, or "Sakura" is revered as a beautiful flowering plant, and cherry blossoms are frequently depicted in Japanese works of art. In April of 1909 the new first lady Helen Herron Taft received a letter from Mrs. Eliza Scidmore proposing that cherry trees should be planted along the reclaimed Potomac waterfront. 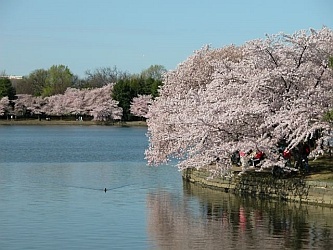 The idea came to the attention of the Japanese consulate, and in August of 1909, the Japanese Embassy informed the Department of State that the City of Tokyo intended to donate to the United States two thousand cherry trees to be planted along the Potomac River. When the trees arrived in January of 1910, the trees were found to be infested with insects and worms. The trees had to be burned to protect the American ecosystem. 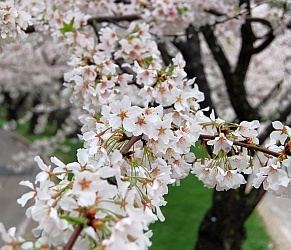 In February of 1912, a new shipment of 3,020 cherry trees from twelve varieties arrived from Japan. First lady Helen Herron Taft and the Viscountess Chinda, wife of the Japanese Ambassador, planted two Yoshino cherry trees on March 27, 1912 by the northern bank of the Tidal Basin. 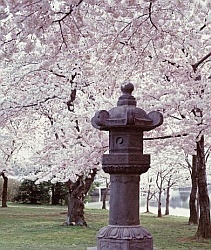 For several more years, workmen continued planting Yoshino trees around the Tidal Basin. The other eleven varieties of cherry trees and the remaining Yoshino trees were planted in the East and West Potomac Parks. 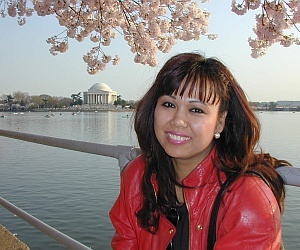 Many events are associated with the National Cherry Blossom Festival. 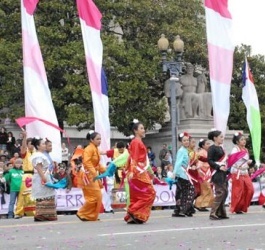 The most popular are the Opening Ceremony, the National Cherry Blossom Festival Parade, the Japanese Street Festival (Sakura Matsuri), and the Fireworks Display on the Southwest Waterfront. The festival includes classic and contemporary performances by many artists. The parade features floats, giant helium balloons, marching bands, and people in traditional costumes. The city becomes focused on Japanese art forms, such as paper folding (origami), watercolor painting on rice paper, and writing haiku poems. Restaurants offer Japanese specialties including sushi and sake. Picture Taking - The Washington monument and the Jefferson and FDR Memorials are in close proximity to the densest plantings of cherry trees. These iconic symbols of American heritage provide wonderful settings for colorful photographs when the cherry trees are blooming. 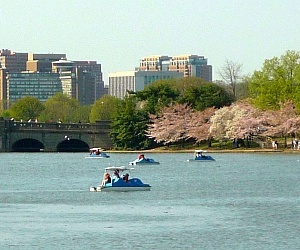 You can rent paddle boats to cruise around the Tidal Basin surrounded by cherry trees. The boats are rented on an hourly basis from 10 a.m. to 6 p.m. Walks and Picnics - The best time to walk around the Tidal Basin and avoid the crowds is during the early morning. Free tours around the Tidal Basin are conducted by the National Park Service Rangers during the Cherry Blossom Festival. 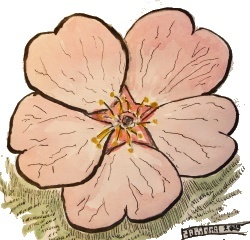 The rangers discuss the history, beauty, and folklore of the cherry blossoms. The park service also organizes a 3.5 mile morning run around the National Mall, evening walks around the Tidal Basin, and guided bike tours of the cherry trees.